Edstrom Van Racking is offered for a range of Volkswagen panel vans. In order to operate in tough conditions while providing ease of use, Volkswagen panel vans need van racking suited both to the van and most importantly, to you. The smallest model, Caddy, can be expanded from 3.2 sq. metres to 3.7 with ease while you enjoy excellent driving comfort with a high ceiling and plenty of storage space. With the mid-range Transporter T6 model, you get a practical, comfortable and safe van fitted with the latest high tech driving features and which can accommodate 3 Euro-pallets. The largest Volkswagen panel van, Crafter, is available in a number of different versions, which enables you to maximize the enormous space to suit your needs. More info on complete van racking systems for Volkswagen vans is available in our custom Volkswagen work van spec sheet. Feel free to get in touch with us or one of our dealers when you have any questions. We always recommend that you get your Volkswagen van racking system installed by one of our dealers. This will ensure that the racking is properly installed. This also gives you a 5-year warranty on the racking and the installation. If you install the van racking yourself, we provide general installation instructions and then you have a 3-year warranty on the parts and accessories. If you need any advice, we and our professional installers are always available. 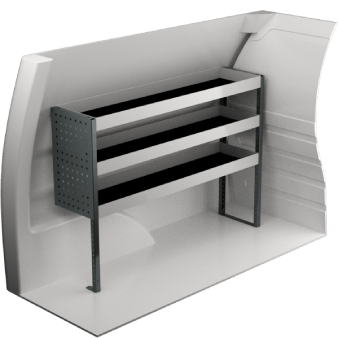 Here at System Edström we have developed complete van racking systems designed for your Volkswagen work van. We offer van racking for the Volkswagen Caddy, Crafter and van racking for the Volkswagen Transporter T6. Our van racking configurations have been developed with functionality in mind, so they always meet your needs. 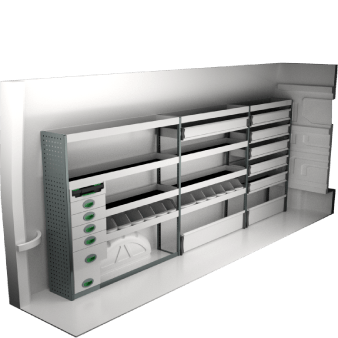 Maybe you just need shelving allowing you to store your tools on shelves, or perhaps you want a more complex system including drawers, carry-all bags and other accessories for a Volkswagen van racking system. Naturally our systems are crash tested. And if you also let our dealer install your system, you get a 5-year warranty into the bargain. 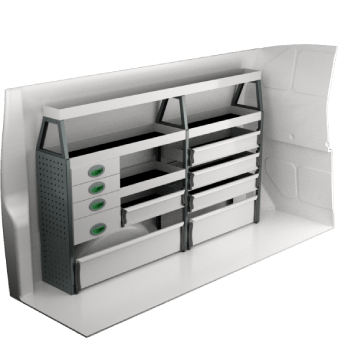 In addition to our complete van racking systems, you can custom design your Volkswagen van racking to suit your particular needs. Our system is highly flexible and if you want to remove or add something, or simply get a personally customized van interior, then our Volkswagen van racking system is the right choice for you. We always recommend that our customers reach out to the expert staff at our dealers to receive the best possible service. The Volkswagen Van Racking accessories that we deal in can be personalized to enhance your vehicle. The major aspect of these accessories is that in spite of being different parts, they are still completely of the quality that Volkswagen has maintained.